Lemon Heights Hefeweizen - A lemon flavored bud light? Red Hill Red: The best of the bunch. Blimp Hangar Porter: A standard porter. Porters aren't usually my favorite and this was no different. Hoppy Pale Ale Special: Only taste was that of hops, and not much else. I wasn't a fan. Old Town IPA: Better than the Special IPA, I guess. Overall, the beers were a bit disappointing. I did show up after a big dinner, so I was kind of full going in, but Its not often I have a flight of 8 beers and only finish one of them (the red). 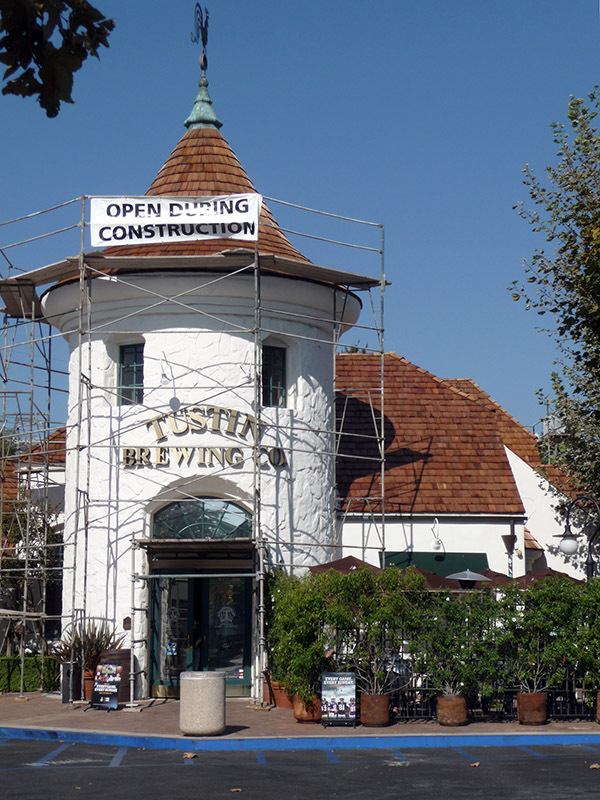 A stucco tower marks Tustin Brewing at one end of a strip mall. In front is a nice outdoor patio area screened by plants. Inside there are very high ceilings. 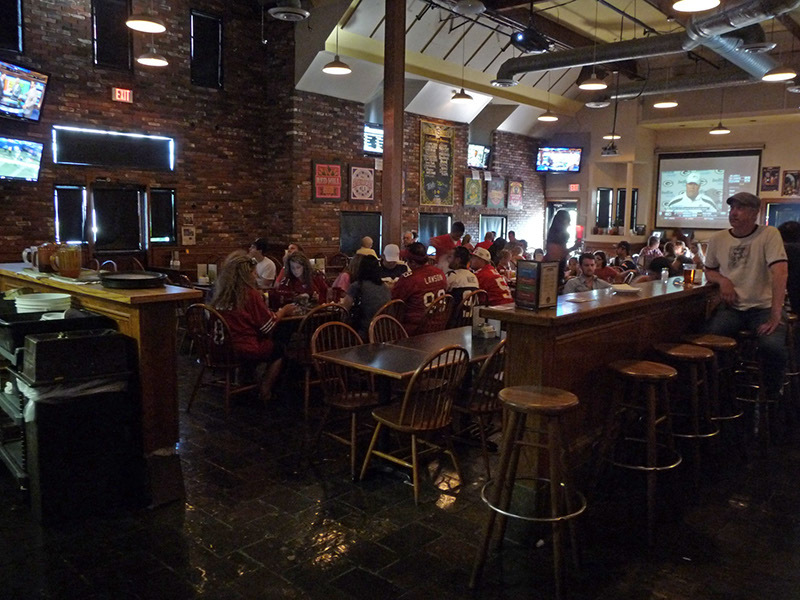 An extremely long wooden bar with stools runs along the left side of the large room. The bar â€œbackâ€ is the brewery itself (no glass). The stainless steel mash tun, brew kettle, control panel, and fermenters are easily visible. The bar area is delimited by a four foot high wooden partition supporting a wooden counter top and equipped with more bar stools. The rest of the space is filled with black formica and wooden topped tables with Windsor chairs. One of the side walls is brick, and the floors are polished stone. At the back of the space is an open kitchen. On the wall behind and above the kitchen is a window revealing kegs, sacks of grain, and the grain mill, on the second floor. On the (NFL football) Sunday we visited, blackout curtains blocked all of the windows along the brick wall, but otherwise presumably there would be a lot of light. The atmosphere is completely suburban, family-friendly sports bar (eleven flat screen TVs and two projection screen TVs), but the beer is quite special. There were eleven house-made beers and four guest beers and the IPA was excellent. You can get a growler filled, too (only in a container with their name on it however, as this is California). The food is standard brewpub fare, but the Diablo burger with salad we ate was quite respectable. 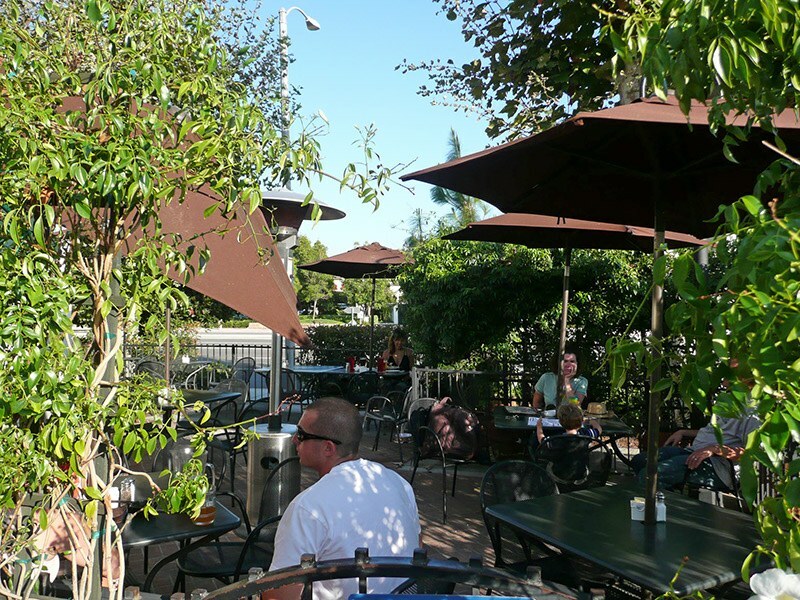 I randomly selected one OC brewpub to visit on my drive from San Diego to LA and picked this one, mainly because it wasn't far out of the way and looked nice from its web site. Stuck inside of a small, upscale strip mall, the place is immediately visible from the street with its spire roof towering over the edge of Newport Avenue. "Small" is the word here though, and parking was a bit of a problem, even at 4:30, when I came in. 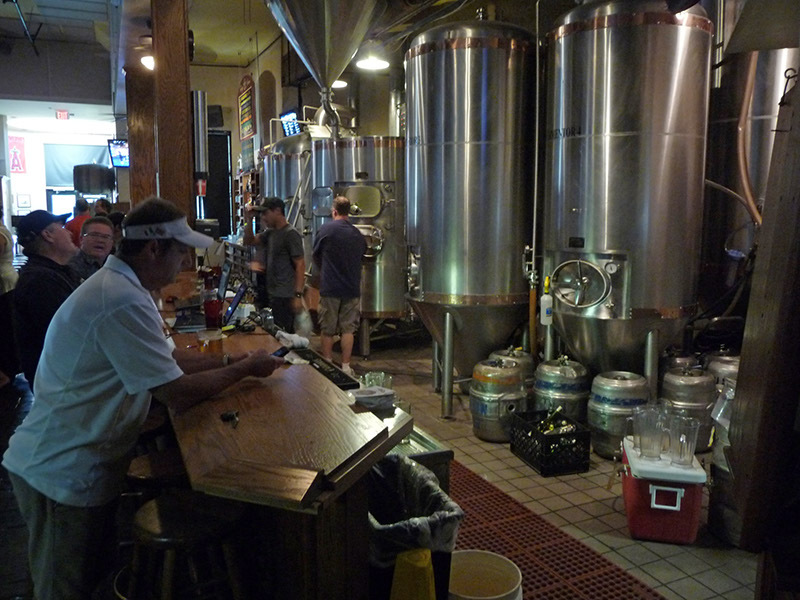 It's a large but cozy place with lots of obviously functioning brewing equipment just behind the bar. Very long bar with additional stools on the opposite side. Lots of tables available. It was a little noisy despite not being full, but I wasn't bothered by it. Plenty of TVs around, but only a couple actually facing the bar, which I thought was nice. There's a weekday happy hour from 3-6, which includes $3.50 pints and discounted appetizers. I ordered a nacho plate, which ran $5.25 (there's a separate happy hour menu) and got the sampler, which was $6. The sampler had 5: Golden Spike (light ale), a spiced red, an APA, a hefe and a porter. Their IPA was missing, as it was missing from most of the specials on the menu, which almost all ended with "...excluding IPAs." The light ale was okay. If you came here with a person who didn't drink much beer or who drank pisswater, this would be the beer for them. I assume that that's the idea behind it. The hefe didn't have much of a wheat taste, but had a very nice color to it. It actually tasted too much like the light for me and I was trying to wash the taste out of my mouth because I assumed that I was still tasting the light. But that wasn't the case. The American Pale had a nice flavor, well hopped, but not too obtrusive. Good, but I wouldn't call it decidedly memorable. The spiced red on the other hand earned its name. There was a lot of spice to it, but not to the point where it ruined the beer. It actually tasted more like a holiday ale. I don't normally like these, but I could have easily drank a pint of this. The porter was very nice. Not too strong, but not weak either, with a very nice flavor. I would have liked to have tried this on cask to get a better sense of its flavor, but it was in the "coming soon" category. On cask was the spiced red, which I got a little taste of. Whereas the CO2 spiced red had its subtle nuances, this version was more of a punch in the face. It was almost like sticking your nose inside of a bottle of a nutmeg/cinnamon mix. Not so much. I also talked my way into a sample of the double IPA and ended up with a pint of that. The bartender first told that it was the regular IPA, but this turned out to be incorrect and they were actually out of that regular IPA. They were also out of the Barleywine, but I don't normally like those and wasn't crying about it not being able to get it. The double IPA was good, but not particularly memorable. Nice flavor, but it tasted a lot like their American pale but with more hops and alcohol. The nachos were fantastic. They had a ton of black beans, sour cream, not too much cheese, and a very interesting, almost fruit-like (maybe it was fruit) salsa. The best part was the service though. They had a shift change while I was there, and both bartenders were very, very nice and attentive and tolerated my questions about the beer, both showing knowledge of their product. They seem to get a lot of locals in the place. When I went, there appeared to be a Kiwanis meeting going on at one of the tables, and most people seemed to know the servers and bartenders. Definitely on the older side, although this is pretty close to Leisure World. If you're in the area, definitely make it a stop. It's only a little over a mile off of the 5.